"Draquila" examines Italian Prime Minister Silvio Berlusconi's handling of the L'Aquila earthquake. Italian Culture Minister boycotted Cannes because of the film, which he called "propaganda"
Filmmaker Sabina Guzzanti: "The idea was this: Explain Italy through L'Aquila"
(CNN) -- She's been called Italy's answer to Michael Moore, and she doesn't pull any punches -- even when the subject she's taking to task is Italian leader Silvio Berlusconi. Filmmaker Sabina Guzzanti puts the prime minister's handling of the L'Aquila earthquake, which killed nearly 300 people and devastated the city when it struck last year, under deep scrutiny in her latest documentary "Draquila -- Italy Trembles." Recently screened at Cannes Film Festival, the documentary is creating a stir among critics and the Italian government alike. Even though he has been dogged by allegations of corruption and fraud -- which he strongly denies -- as well as criticism of his personal lifestyle, many Italians still support Berlusconi. There are so many scandals in Italy, the picture can get quite complicated, Guzzanti told CNN. At home, she is a well-known political satirist and critic of the government. She decided to focus on one disaster, L'Aquila, to show how abuse of power, corruption and misinformation have contributed to what she presents as the precarious state of democracy in Italy today. "The idea was this: Explain Italy through L'Aquila," she told CNN. The Italian government has responded angrily to the film, whose title is a combination of the words "Dracula" and "L'Aquila." Culture Minister Sandro Bondi refused to attend Cannes, where the film was shown as part of the festival's special screening program. Bondi issued a statement, dismissing the documentary as "propaganda" and saying it "offends the truth and all of the Italian people." Guzzanti is used to incurring the government's displeasure. "Raiot," a political satire TV show she wrote, directed and acted in, was cancelled after just one episode on a state-owned television network following a defamation suit filed by Silvio Berlusconi's Mediaset TV network. The idea was this: Explain Italy through L'Aquila. In a retort, she made "Viva Zapatero," a 2005 film that examines censorship. So, what is it about "Draquila," Guzzanti's fourth feature, that has created an uproar among Berlusconi supporters? Guzzanti argues that Berlusconi, whose ratings were suffering when the earthquake hit in April last year, took advantage of the tragic event to improve his image and boost the public's opinion of him. The documentary uses straightforward language to paint a stark picture of what the filmmaker sees as Berlusconi's exploitation of the tragic event. "Opinion polls showed his popularity was plummeting. So, when, at 0332 on April 6, 2009, an earthquake awoke even those in the Big Brother house, and when it emerged an entire town was destroyed, for Berlusconi it was like God reaching out to him again," a voiceover says in the film. In the wake of the quake, Berlusconi made a last-minute decision to move the G8 Summit to L'Aquila from Sardinia -- a gesture that attracted world attention -- and took advantage of photo opportunities in several trips to the leveled city. Even more damning, though, is the documentary's examination of the reconstruction efforts in L'Aquila. In particular, the film takes issue with the role played by the Civil Protection Authority. 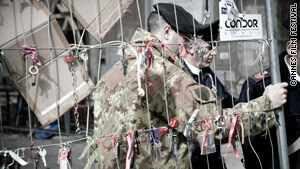 The film argues that the government agency has amassed such immense power under Berlusconi that it can dodge the law -- when granting reconstruction contracts, for instance -- all in the name of emergency and safety. For Guzzanti, investigating the aftermath of the earthquake and the power of the Civil Protection Authority is a way of examining Italy's drift into authoritarianism. "They became like a private army of the prime minister with licence of spending money and making laws," she said of the agency. "And I was shocked and started to investigate." Her film has won praise, not only for its high degree of scrutiny, but for its even-handedness as well. The Hollywood Reporter described "Draquila" as a "straightforward and surprisingly balanced documentary." While her probing style and knack for ruffling feathers make it easy to draw comparisons with Michael Moore, Guzzanti distinguishes herself with an ability to control her outrage. As Variety pointed out in its review: "While she's omnipresent, this is not the Sabina Guzzanti show; the helmer knows she doesn't need to constantly register her outrage for it to come across." Grace Wong and CNN's Neil Curry contributed to this report.